Lakshamanbhai M Patel doesn’t like to get into any argument against Prime Minister Narendra Modi. "Tamne je lakhwanu hoye teh lakho…ame toh Modiji ne poojiye che (You write whatever you want to…I worship Modiji)." Sitting under a tree on the roadside of Aithor village in Unjha taluka of Mehsana district on a Thursday morning, Lakshman adds: "Prime Minister Modi is going to come back. He is the best leader in the country and besides that he is the son of Gujarat." Similarly, Mafatlal Ishwarbhai Patel claimed that Modi has brought India global respect in the past five years. "He will be getting a second term to finish lot of work. Even as a chief minister, he brought a lot of development in the region like road, round the clock electricity and water supplies." Both of these men said that they haven’t heard of "surgical or airstrike". But they mentioned that "Pakistan will behave properly if Modiji is around". A question on popular leader from their community Hardik Patel annoyed them. They said that he should not have joined the Congress. "He is a traitor now. He used the community for self-goal. How can a person who never had a proper house suddenly drive a car worth Rs 36 lakh?" Mehsana Lok Sabha seat is symbolically important for the BJP as it was one of the two seats that the party won in 1984 for the first time. Over the years, the BJP has retained this seat because of the massive support from the Kadva Patel community. In Tarab village, that has a sizable population of Patels, Thakor (Other Backward Caste) and SCs, Jaisang Chaudhary is harvesting wheat on his four acres of land with the help of farm labourers mostly women from SC community. "I am very happy with Prime Minister Narendra Modi and my vote would go to his party. I don’t care who is contesting," he said while adding that he received Rs 6,000 cash recently under the scheme launched by Modi for marginalised farmers. He did identify BJP candidate Sharda Patel and Congress's A J Patel but said that they don't matter to him. But Manjuben Makwana, who works for Chaudhary as farm labourer, doesn’t agree. "I am a bhangii (SC) and haven’t received anything from Modi government. And to tell you the reality, I feel both Modi and Rahul (Gandhi) are same. But I will vote certainly to anyone leaders of my community would tell me." A little ahead lies Valam village dominated by Thakor community who belong to OBC. In Mehsana Lok Sabha seat this community can make or break any party. Shankar Thakor, a farmer in his 30s, has a tractor and farms that yield enough crops to run his family. "As a kid I had no idea about any politician. Now you ask my five-year-old son and he will tell you the name of Modi. I am going to vote for him even if my community leaders tell me to do otherwise." The BJP is selling Prime Minister Narendra Modi’s image in big way. The hoardings across the region display him prominently, invoking his "achievements" as the leader "who got India recognised as "space superpower." 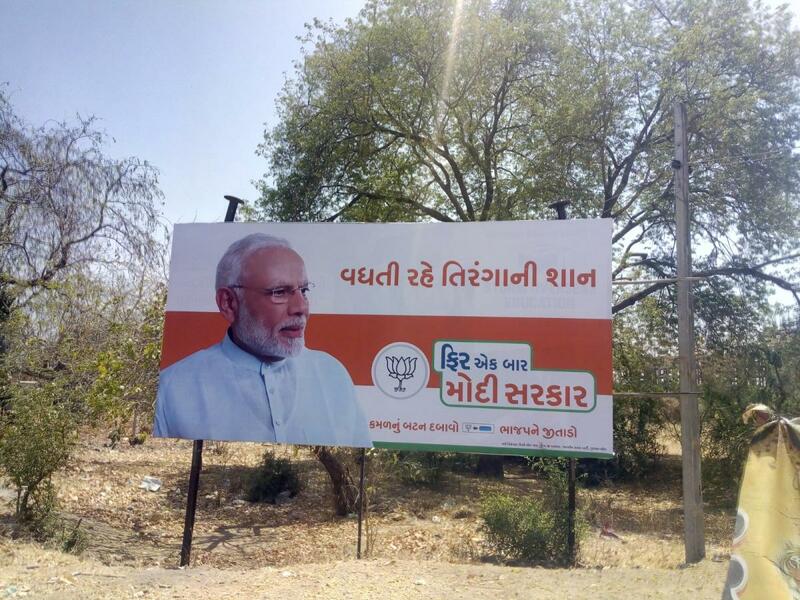 Another hoarding reads, "Let the glory of Tricolour grow… Modi Sarkar… Fir Ek Bar".